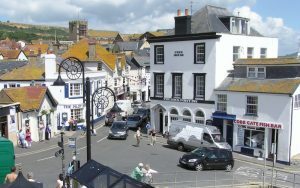 DA’s former President, Dr Todd Gray, walked from Lyme Regis to Hartland over eleven days in mid-May 2017 stopping overnight in towns and villages to give a talk promoting The Devonshire Association. He invited people to join him by attending his talks or by accompanying him for a day or part of a day or any other way they wished to be part of this unique enterprise. Each leg was about 11 miles and started at 9 am., finished at 5 pm. with a break in the middle of about 1½ hours. The first two days were on the SW Coastal Path as were the last two days, but the remainder of the route was based on the Ordnance Survey Explorer Maps (1:25,000) using footpaths, roads coloured yellow on the map and occasional brown roads. The route ran as follows: Lyme Regis, Seaton, Sidmouth, Ottery St Mary (lunchtime talk), Whimple, Silverton, Crediton, North Tawton (talk at Bow), Hatherleigh, Shebbear, Bideford, Clovelly, and Hartland. The hike across the county earlier this year was both hugely enjoyable and thought-provoking. Colin Turner recruited new members as we walked from Lyme Regis to Hartland but the eleven days provided enough thinking time to ponder over the tremendous differences in the Devon landscape and it also revealed a passion for our county among its inhabitants. I was expecting the countryside to look extraordinarily beautiful and the time of year gave us bird song in every step. I knew that the coastlines in the south and north would be dramatically different but so too was the inland scenery. Each evening lecture had a different audience: different not just in the individuals but in the types of people. The audience at Sidmouth was unlike that at Shebbear or any other others along the route. 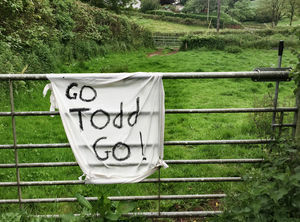 A very real passion for Devon was often exhibited and I found this very encouraging for the future of our society. This schedule is based on the OS Explorer Maps (1:25,000) nos. 115,114,113,112 and 126, and the book versions 1. North Devon and 4. South Devon for the costal paths. We use the terms footpath for rights of way shown by green dots, country roads for roads coloured yellow and brown roads for B roads. Moderate walking. Meet at 10am at the Lifeboat station at the inner end of the Cobb. Follow coastal path. No pub, bring packed lunch. 7.30pm. Talk at the Town Hall. Strenuous walking, severe in parts. Meet at 9am at the western end of the Esplanade. Café at Branscombe Mouth. Follow coastal path. 7.30pm. Talk at the Cellar bar, Kennaway House. Moderate walking. Meet at 9am at eastern end of Esplanade. Leave Sidmouth by Bickwell Lane and Greenway Lane to Northmoston. Turn north to Harpford and follow footpath beside the Otter to Tipton St John and Ottery St Mary. Pubs available. 2pm. Talk at the Institute. Leave Ottery Saint Mary at 3pm by the B3174 and take 2nd turning right on to country road passing Birdcage and going under the A30 to Yellands, Cross Town and Whimple. 7.30pm. Talk at Victory Hall. Moderate walking. Meet at the church at 9am. Go west on country road and turn north under railway line; pick up footpath to brown road at 034976. Follow road to Wards Cross and a little bit beyond. Go north on footpath, then west along country road and then another footpath going north to cross at Westwood. Take track to Channons farm and Ashclyst Forest and Rewe Cross. Follow country road and then footpath under M5 to Budlake. Use brown road to Ellerhayes Bridge. Then footpath and country road, past Hayne House into Silverton. No Pub, so bring a packed lunch. 7.30pm. Talk at the Village Hall. Moderate walking. Leave the centre of Silverton at 9am and walk south to Stumpy Cross. Turn west and cross the A396. Pass through Latchmoor Green and over the Exe into Thorverton. Continue west past Chapel Cross and Exeter Hill Cross and into Shoebrooke. Pub available for lunch. Pick up the Devonshire Heartland Way into Crediton. 7.30pm. Talk at the Boniface Centre. Steep at first and a bit up and down in parts. Meet at 9am at road junction just short of the Community College (825004). Take country road to Pitt Farm and Hollacombe Cross. Turn north and then west onto footpath to Penstone. Pick up Devonshire Heartland Way to Appledore Farm and then country road into Bow. Lunch at Pub. In the afternoon leave Bow on the A 3072 and turn north at Burston Cross. Turn west just beyond higher Burston Farm and use country road all the way to Staddon Moor Cross. Turn south west into North Tawton. 7.30pm. Talk at the Congregational Church Hall, Bow. Easy going. Meet 9 am at the church in North Tawton. Go west on brown road and cross the Taw. Fork right to Bridge Farm and then north west to Redpost Cross and Bondleigh Moor Cross. Use country road to Venn Copse Cross, Corstone Cross, Splatts Cross and Burrow Cross into Monkokehampton. Use brown road going south west into Hatherleigh. No convenient pub before Monkokehampton, so bring packed lunch. 7.30pm. Talk at Old Schools. Easy going. Meet at 10am at roundabout at junction of A 386 and A 3072, just south of Hatherleigh. Take footpath to Littlewood, Pangkor House, Keyethern Farm. Join country road at 505057 and turn west and then north into Sheepwash. Pub lunch. Leave at 2pm on footpath going north west to Upcott Barton, Upcott Avenel and Woodhead. Use country road to Sedgewell Cross, turn west to Battledown Cross and into Shebbear. 7.30pm. Talk at Lake Schoolroom. Long day but reasonably easy walking. Meet at village square at 8.30am. Take footpath to Manorpark and country road to North Furze. Footpath and then country road to Stapleton Farm Forches and Langtree. Pub lunch stop. Brown road to Buda, country road to Gortlage and Watergate Bridge. 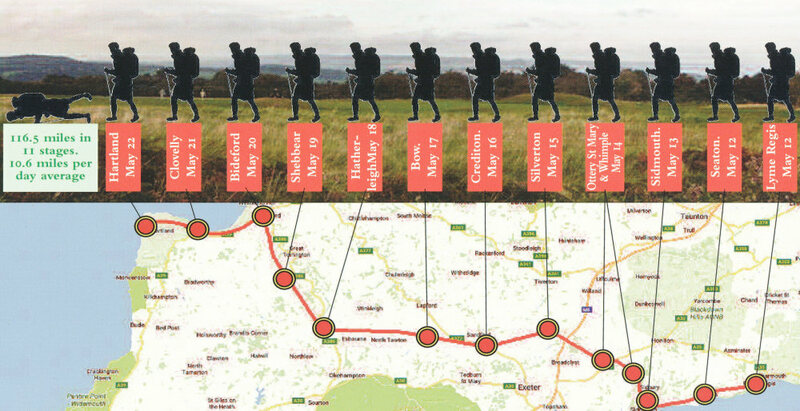 Join Tarka Trail for the last 6 miles. 7.30pm. Talk at Burton Art Gallery. Strenuous along the coastal path. Meet at 9am in the centre of Abbotsham. 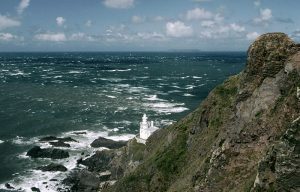 Join the coastal path at Greencliff and follow it to Clovelly. Meet at 10am at the top of the village and take the coastal path as far as Brownsham Cliff. Country road to Lower Brownsham Farm and Yaham Cross. Turn south west to Rosedown and Eastdown and into Hartland. 7.30pm. Talk at Methodist Hall. Previous item Why a new website?